Established in 1979, we are northern NJ's premiere pool and spa service company. We specialize in the customization and installation of safety pool covers. Creation or renovation of residential and commercial pools, spas, waterfalls and fish ponds. Creation or renovation of residential and commercial pools, spas, waterfalls and fish ponds. We offer expert plaster, piping, painting, coping and tile work as well as technical upgrades. We specialize in all of your aquatic needs. Openings, closings, cleanings, chemicals, maintenance, leak detection, repairs, heater and electronic equipment installations and supplies. We are proud resellers of Loop Loc ® Safety Covers which exceed minimum Standard Performance and Specification set by the American Society for Testing and Materials (ASTM). 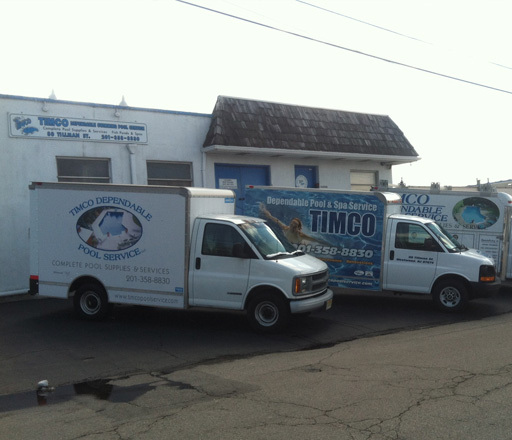 Established in 1979, Timco Pool Service has been northern New Jersey’s premiere swimming pool and spa Service Company. While maintaining the majority of our original client base, Timco has grown dramatically over the years as a result of our reputation for quality service and attention to detail. Timco Pool Service is not limited to only pools and spas. Our innovative water garden and fish pond designs have been featured in "Better Homes and Gardens" magazine. Timco Pool Service continues in our tradition of excellence and quality for our customers, and we look forward to working with you to create your own personal "backyard paradise". Timco Dependable Swimming Pool Service, Inc.
80 Tillman Street Westwood, N.J. 07675. PLEASE CONTACT US WITH ANY QUESTIONS OR FOR A FREE ESTIMATE! Through continuing education and certification, our service technicians are highly skilled and utilize the latest in pool and spa technology.